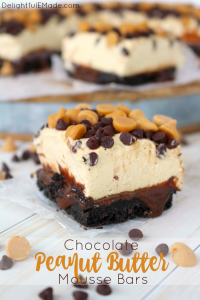 An amazing recipe for No Bake Cheesecake Bars! 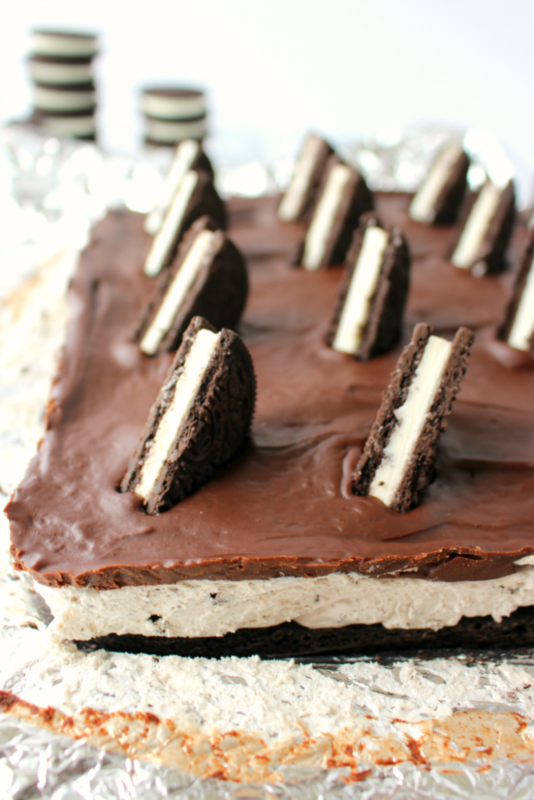 The ultimate dessert for anyone that loves OREO cookies! 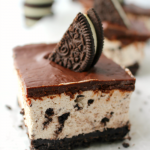 These no bake cheesecake bars offer a thick OREO crust, creamy OREO cheesecake filling, and topped with a delicious layer of chocolate. 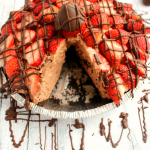 This easy, no-bake dessert is perfect for just about any occasion! 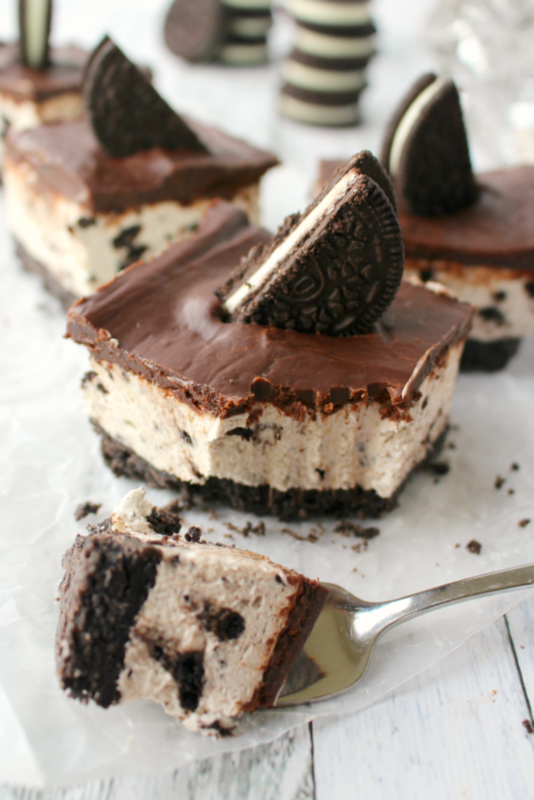 On top of the crust, then comes the delicious no-bake OREO cheesecake filling. 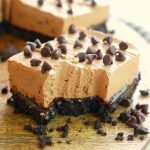 If you’ve ever made any type of no-bake cheesecake dessert, you’ll soon realize this is a really easy and delicious cheesecake-like filling that requires no baking. Fantastic, especially during the summer when turning on the oven is the last thing you want to do. 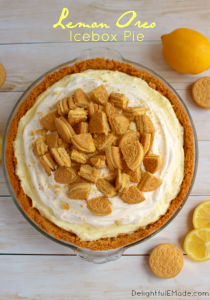 I’ve also used this same no-bake cheesecake filling for pies. 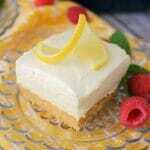 My Lemon Raspberry Pie over at Real Housemoms is a perfect way to enjoy pie without having to turn on the oven! 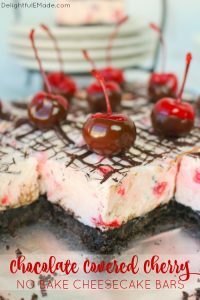 I then top these decadent bars with a yummy layer of chocolate and garnish with a half-slice of an OREO – what else, right?! Not only is it the perfect garnish, but the cookies sit easily in the chocolate and are a great way to give a bit of a hint of what is to come on the inside of this amazing bar. 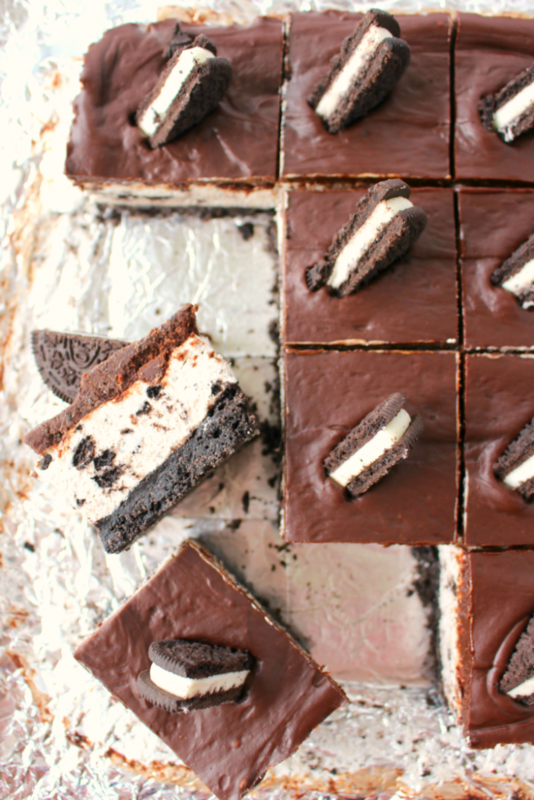 One bite of these fabulous OREO bars, and you’ll be hooked! 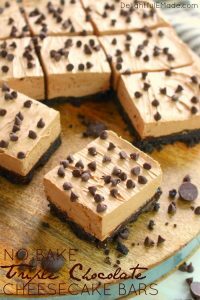 These are fantastic for a pot-luck, a great dessert for a celebration or a yummy way to satisfy a sweet tooth! To make the topping, add the chocolate chips into a bowl. In a small saucepan, bring the cream to a low simmer, and remove from heat. Pour the hot cream over the chocolate chips, and continually stir with a rubber scraper until all the chocolate chips have melted and become smooth. Let the chocolate cool slightly. 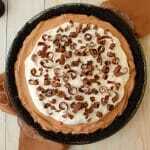 Pour the slighly cooled chocolate over the top of the cream cheese layer, and spread evenly. Even place the 16 OREO cookie halves into the chocolate. Refrigerate for at least 30 more minutes or until chocolate is completely set and firm. Cut into 16 squares. Holy Moly! I can't wait to try these! My husband eats anything with oreos! He'd love this! Thanks for sharing on the What's for Dinner Link up! WOWWWW What a gorgeous and super-delicious cake! I am seriously craving Oreos now! This looks so delicious and I'm so glad you shared your recipe with us at Share The Wealth Sunday! These look unbelievable! 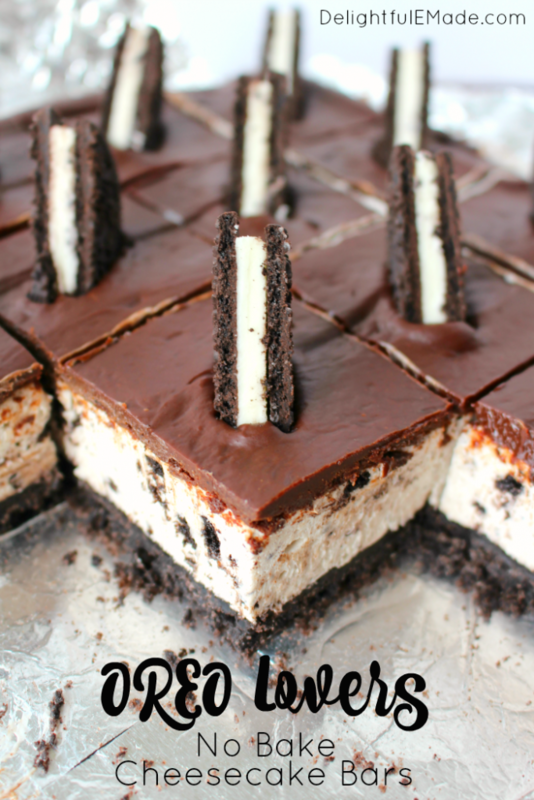 My best friend is an Oreo nut, so I can't wait to make these for her! 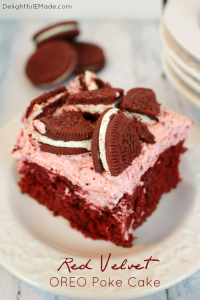 My family often requests my Oreo Delight recipe, so I bet they would like this, too. 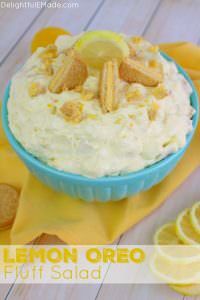 I wonder if homemade whipped cream would work in place of the cool whip in this dessert? Oh, wow! These look incredible! They wouldn't last long in this house - that's for sure! Thank you for linking up to Family Joy Blog Link-up Party. Have a great week! This sounds heavenly! 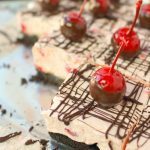 I love no bake bars for summer get togethers. Can't wait to try it. Pinne. Oh wow. My kids love oreos. This would be a big hit at my house. Oh my these look fabulous! Hopping over today from the #shinebloghop. I will definitely try these!They look so so good :D Yumm! Oh my gosh! This is an Oreo lover's dream! We're featuring it over on Happiness is Homemade this week. 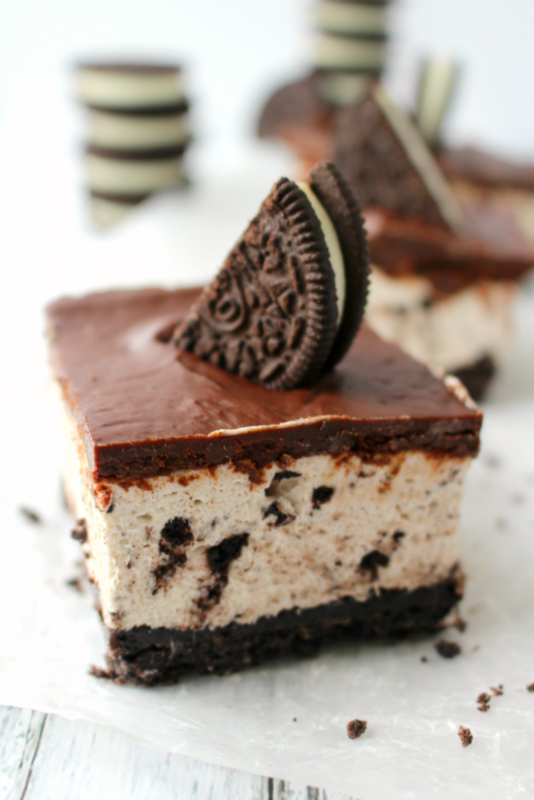 I'm going to have to make this for my husband, a lover of all things cheesecake and Oreos! Looks so good. 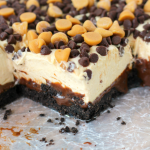 Perfect summer dessert being no bake. Thanks for sharing at the #InspirationSpotlight party. Shared See you again soon. Yum! What a delicious looking dessert! We don't have Cool Whip where I live. Is there anything I can use in place of that? These look delicious and I'd love to make them. Thanks! What is frozen whipped topping? Oreo's have to be one of the best-loved cookies. I happen to love the peanut butter flavor! 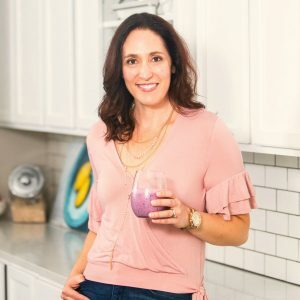 Thank you for sharing this delicious sounding recipe on Party in Your PJ's.